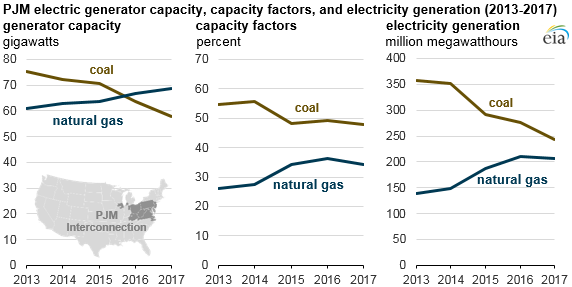 The average annual capacity factors for natural gas-fired generators in the PJM Interconnection—the largest competitive wholesale electricity market in the United States—have increased in recent years, reflecting greater use of natural gas-fired generators in the region. The increase in PJM’s capacity factors for natural gas-fired generators is the largest of any regional transmission organization in the country in the past five years (2013–2017). Capacity factors are an indicator of how often a generator is run, and the combination of additions of natural gas-fired capacity in the region and higher capacity factors have meant that utilities in the PJM Interconnection have been generating more electricity using natural gas. Similar to the rest of the country, the share of natural gas-fired electricity generation in PJM has increased during the past five years as relatively low natural gas prices have made natural gas more cost-competitive with coal. Much of the increase in generation from natural gas is from generating units using combined-cycle technology. By comparison, the use of natural gas-fired combustion turbines in PJM has remained relatively constant. Average annual capacity factors for natural gas-fired combined-cycle generators in PJM first surpassed those of coal-fired generators in 2015. Relatively lower natural gas prices—in part because of PJM’s proximity to Appalachian natural gas production—have been a primary driver for increasing natural gas capacity factors. The monthly average cost of Central Appalachian coal in the PJM region averaged $2.76 per million British thermal unit (MMBtu) in 2013 and has only slightly increased since then, most recently averaging 3.30/MMBtu in 2017. 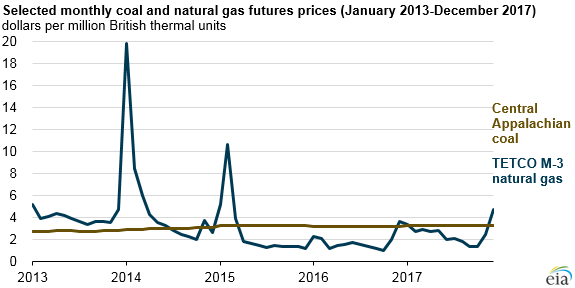 In contrast, the monthly average price of natural gas at the Texas Eastern Transmission Market Zone 3 (TETCO M-3) hub, which generally reflects natural gas prices in Pennsylvania, New Jersey, and New York, fell below the price of coal on a dollar-per-MMBtu basis in mid-2014 and, with the exception of winter price spikes, has remained lower than the price of coal since then. The addition of new natural gas-fired capacity and the retirement of older generating units, mostly coal, have also affected PJM’s electricity generation mix. From 2013 through 2017, 14.4 gigawatts of coal capacity in PJM was retired, or about 19% of the region’s total. About 1.8 GW of natural gas-fired capacity was also retired, but 11.0 GW were added, increasing the region’s natural gas capacity by 18%. 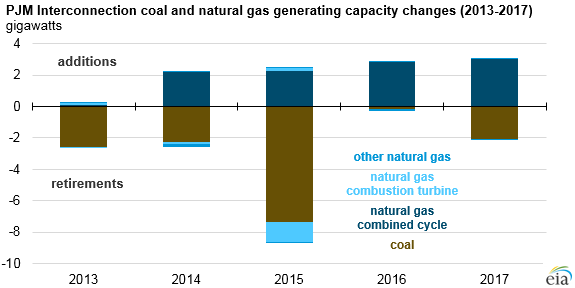 Of that added natural gas capacity, 95% was combined cycle. Higher capacity factors for natural gas-fired combined-cycle generators in recent years also indicate a fundamental shift in day-to-day operations of these power plants. Natural gas-fired generators were traditionally used as either intermediate load following (cycling) or peaking resources. In recent years, however, combined-cycle power plants have become more competitive with coal-fired plants for baseload operations and have led to increasing retirements of coal plants.